Outdoor living continues to grow in popularity with more homeowners increasing their property values by upgrading their yards. Statistics show that along with interior kitchens and bathrooms, designed and curated outdoor living spaces can contribute to a strong R.O.I. upon selling. Outdoor kitchens are leading the pack! Concrete countertops are both highly functional and attractive because of its relatively maintenance-free properties and design flexibility. Like natural stone, concrete is porous and it’s recommended to protect the surface with a food-grade sealer, or finishing wax to prevent water and stain absorption. More noticeable with darker concretes is the tendency to fade and turn yellow in the sun. 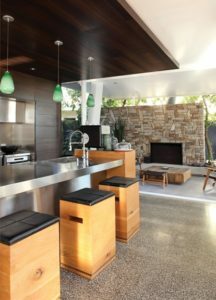 Homeowners have a choice with the type of concrete to order: If sustainability and/or reducing the weight of the countertops is a concern, glass-fiber-reinforced concrete (GFRC) is a good option instead of conventional pre-cast concrete. GFRC uses significantly less portland cement than regular concrete, and it often incorporates large quantities of recycled materials. GFRC is also stronger than standard concrete allowing countertops to be cast in thinner slabs and weigh as much 75% less. These stones will always be enduring and classic choices for indoors and outdoors. As with other surface materials, a full-slab countertop is the most attractive and functional. Granite in particular is popular for outdoor uses. But you’ll want to be mindful of the porosity of the granite you choose: it will determine the level of maintenance required. Granite is typically a silicate-based stone versus a calcite-based stone like: marble, travertine and limestone. However, granite could also be a mix of silicate/calcite. Which means that the surface could corrode or “etch” when exposed to acidic foods and liquids, ie: alcohol, lemon juice, vinaigrettes, etc. Sealing is a good idea to prevent stains though many varieties are dense enough that you don’t need to apply a sealer. The Lemon Juice and Oil Test: Perform this test on samples chipped off the exact slab you are considering for installation. Line up all your samples in row. Drip enough lemon juice to form a dime-sized puddle on the first sample. Do the same with vegetable/olive oil. Look at the surface of the stone through the puddles and note the time. If you see the surface under the puddles darken right away, this stone is very absorbent and should NOT be used in the kitchen. If the stone does darken, but it takes 4 or 5 minutes, then applying a granite sealer will make this stone manageable in the kitchen… it’ll be reasonably stain resistant. If it takes 10 to 15 minutes to darken a sealer should still be applied, but make sure it absorbs well and doesn’t dry on top. If the stone never darkens or it takes 30 minutes or more, then you have a near stain-proof winner that probably would not take a sealer even if you tried. Wipe the sample clean and look at the spot where the lemon juice was… is it dull compared to the shiny polish on the rest of the sample, or did you notice the lemon juice fizzing/bubbling when on the surface? If so, it contains calcite and should not be used in the kitchen. Perform the same test procedure on each of your samples. Knowing this will help you to choose wisely and will require almost no maintenance beyond proper cleaning. Porcelain is an excellent choice for outdoor countertops. It’s very dense, non-porous and it’s wears very well particularly with through-body tile. Overly large formats and very thin profiles are now available with incredible density and strength. And they are rated for residential and commercial outdoor use. Stainless steel has many pros and cons for residential usage indoors and outdoors. On the plus side, it’s a cinch to clean up, doesn’t harbour bacteria and requires zero maintenance. Using a stainless steel countertop harmonizes the flow of steel appliances. It creates a modern and clean-lined aesthetic. Depending on your style preference, this may or may not be appealing. *Unless the steel countertop is shaded, it will get hot when exposed to sun and is highly reflective in the sun. *Like some stone, it has a higher price point to custom fabricate. *Stainless steel countertops can create noise from ordinary usage when setting dishes or tableware down. Insulating the countertop can help to dampen excessive noise. Corian and Quartz: colour will fade, prone to stains, burns and scratches. Barbara’s talent, expertise and passion have contributed to her success designing functional and stylish interiors for her residential and commercial clients. As a guest contributor to media stories on interior decorating, outdoor decorating and sustainable design, Barbara’s outdoor decorating was featured on the cover of Our Homes, Mississauga in the Spring 2016 issue. She’s also been invited as a guest expert in Toronto Home magazine, on The Zoomer TV show, The National Post, CBC Radio and has been featured on many online sites. She was a guest speaker at various GTA Home Shows, a spokesperson and brand ambassador for LG Canada and Johnson & Johnson Inc. She also gives tailored presentations on interior decorating trends and sustainable design to public and design industry groups.